A leather bag can easily be stained and this can happen to anyone. 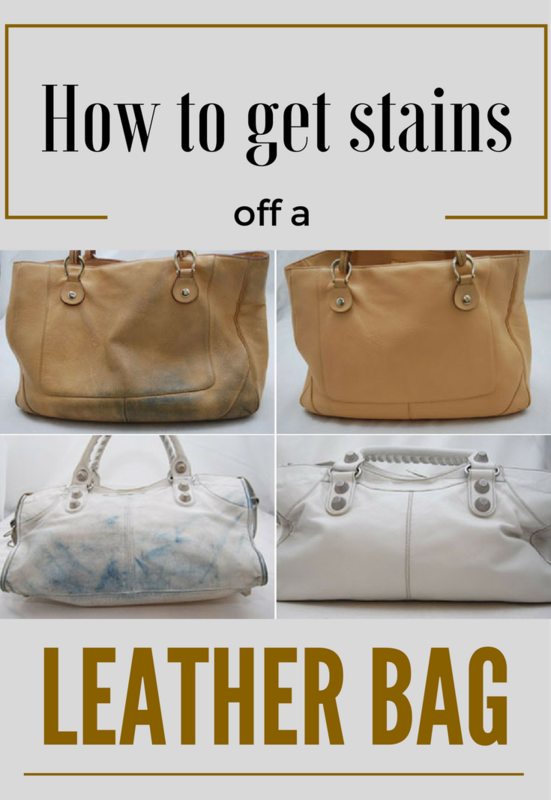 In general, removing stains from a leather bag can be risky and thus we don’t recommend doing this at home. Here are some tips for minor stains that can be removed at home. Always test the cleaning product on an area less visible (inside the bag). Leather or vinyl bags can be cleaned with soap and water. When cleaning a leather bag, remember that is made from the skin of an animal that was once alive. The leather needs to breathe. If suffocate the leather with an inappropriate cleaning solution or you allow a stain to harden or dry, the leather can dry out, lose its color or even crack. Do not use synthetic cleaning products or those made from petroleum. Use a soft, not a harsh one that can leave marks on the leather bag. It is easier to remove stains from a leather bag that was maintained and cleaned regularly. The handle and the areas touched by hands are filled with grease that attracts dust and dirt. Periodically wipe the leather bag with a cloth soaked in water and a little soap. There are natural solutions that moisturize the leather and usually are found in stores that sell leather handbags and other leather goods. Do not spray any solution, not even water directly on the leather! Spray on fine cloth first and then apply on the bag’s surface. If the stain on your bag is big, do not despair! Usually we face two types of stains: wet stains and dry stains. A wet stain is caused by water-based substances – like ketchup is. These stains are easier to remove and you can do this at home. Dry stains are produced by oil, wax, lipstick, glue, adhesive, ink, and are more difficult to remove. Therefore we recommend calling the professionals. For wet stains use warm water and soap. Use warm or at room temperature, never hot water! Apply and wipe without rubbing the stained area to avoid affecting the color. It is easier to remove a stain from a leather bag when it is still fresh. If the stain is not completely removed in the first place, do not rush! Repeat the operation later. Some stains are removed after a few cleanings. Do not wear pencils or pens in your purse. Ink is the most difficult to remove, even for professionals. Make sure there are no liquid containers inside that can spill – like cosmetic products. Make sure your hands are clean and dry before you grab the handle of the bag! Do not put the bag on dirty surfaces or worse, on the floor! Weather is a factor to consider when choosing which bag you want to use. Some leather types can not be exposed to rain and moisture. Excessive sun exposure can also discolor the leather. Do not store a leather bag in a plastic bag. The leather has to breathe, remember? If you give them the necessary care, leather bags will last longer than expected.